A University of Toledo researcher recently received a $2.64 million grant from the National Heart, Lung and Blood Institute to continue her groundbreaking study into how the unique colonies of tiny microorganisms living in our gut can regulate blood pressure — or lead to hypertension. High blood pressure is one of the most common ailments among American adults. According to figures from the U.S. Centers of Disease Control and Prevention, one in three adults has hypertension. And only about half of those have their condition under control. 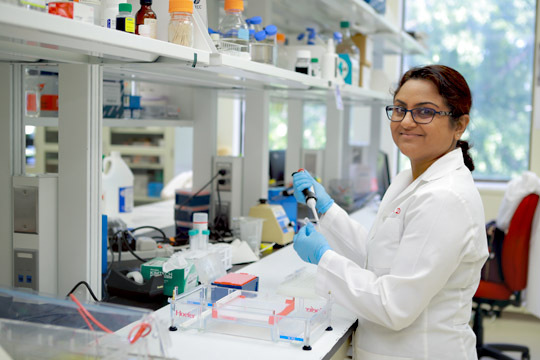 Dr. Bina Joe has received a $2.64 million grant from the National Heart, Lung and Blood Institute for her research on hypertension and gut bacteria. But even those who are actively controlling their hypertension are frequently just masking the problem. The hope is that the grant-funded research could ultimately lead to breakthroughs that would give clinicians a way to treat or even prevent high blood pressure by manipulating those microorganisms, also known as microbiota. Researchers have long known that our genes can predispose us to high blood pressure. But only more recently — thanks in large part to the research by Joe’s team at The University of Toledo — has the medical community begun to realize how the microorganisms living in our bodies play a role in that equation. • First, researchers will look into how an individual’s genome determines which microorganisms flourish in their guts. • Second, researchers will look at the effects of high salt consumption on the animals’ microbiota. Salt can kill bacteria, and it’s possible, Joe said, that high salt intake can disturb the microbiota that are beneficial to maintenance of normal blood pressure. • Third, researchers will look at epigenetics — essentially how gene function can be altered by environmental factors and diet. Though the work is still early, Joe and her graduate student, Saroj Chakraborty, have already been granted a patent. Researchers isolated a certain chemical called beta hydroxybutyrate that increases with exercise, but decreases with salt consumption. Joe said it’s possible that exercise benefits hypertension in part because of the higher concentration of that compound. The lab fed hypertensive rats a precursor of that molecule to see if their blood pressure decreased. Some of Joe’s earlier work on microbiota and hypertension also is getting attention for its intersection with the growing worry that overuse of antibiotics is leading to an increase in drug-resistant superbugs. Research led by her lab found that common antibiotics could lead to a spike in blood pressure for certain individuals, while other antibiotics may actually reduce blood pressure in hypertensive patients. The reason for that discrepancy appears to be tied to how the antibiotics interact with an individual’s microbiota. The findings, which were recently published in the journal Physiological Genomics, could lead to additional studies that hone a more individualized approach for physicians to consider when using antibiotics to treat infection. “I think this study is hugely important for the future of prescribing antibiotics. They’re prescribed so often to hypertensive individuals, and this study shows that can have a really negative affect on their blood pressures,” said Sarah Galla, an MD/PhD candidate, who worked with Joe on the study. This entry was posted on Monday, September 10th, 2018 at 3:27 am and is filed under Medicine and Life Sciences, News, Research, UToday .